The following is information about response activities by the New York State Department of Health to address local water supply concerns. For more information about the blood testing please contact the NYS Department of Health at 518-402-7950. For all other inquiries please use the contact information below. 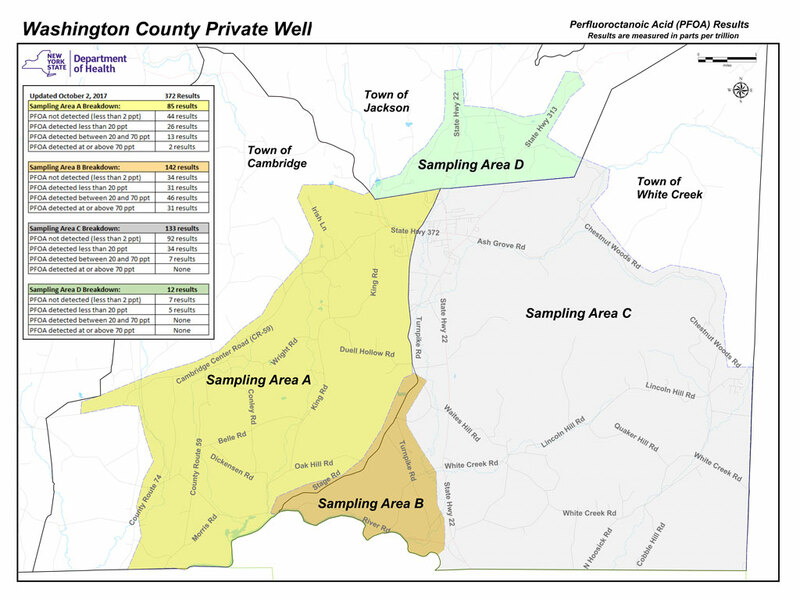 DOH has launched this online survey tool for communities across the state facing PFOA/PFOS contamination. The survey asks questions about residential history, drinking water consumption, occupational history, and health conditions. This survey will help the Department gather information from current residents as well as former residents who may have moved out of the community and were not able to participate in previous community surveys. The information collected will help identify exposure, risk factor and disease patterns in these communities. Survey results and individual data collected will remain confidential. Only group results will be made public. A Granular Activated Carbon (GAC) filtration system has been installed on the Petersburgh municipal public water system that is effectively removing PFOA from water before it enters the system. Repeated testing throughout the municipal public water system has shown that PFOA has been reduced to non-detectable levels. Normal use of the water will clear PFOA from your household plumbing, but if you prefer, you can choose to flush your indoor plumbing, fixtures, and appliances. In-home Water Filtration Options for Household Drinking Water (PDF) Please note the recommendation for using bottled water is no longer in effect.